Los Angeles, CA, November 30, 2016	(Newswire.com) - ​​​​​​​​​Cooking in With Joycelyne is a popular new show on Amazon Prime starring noted actress Joycelyne Lew, which grew organically from her passion of cooking. 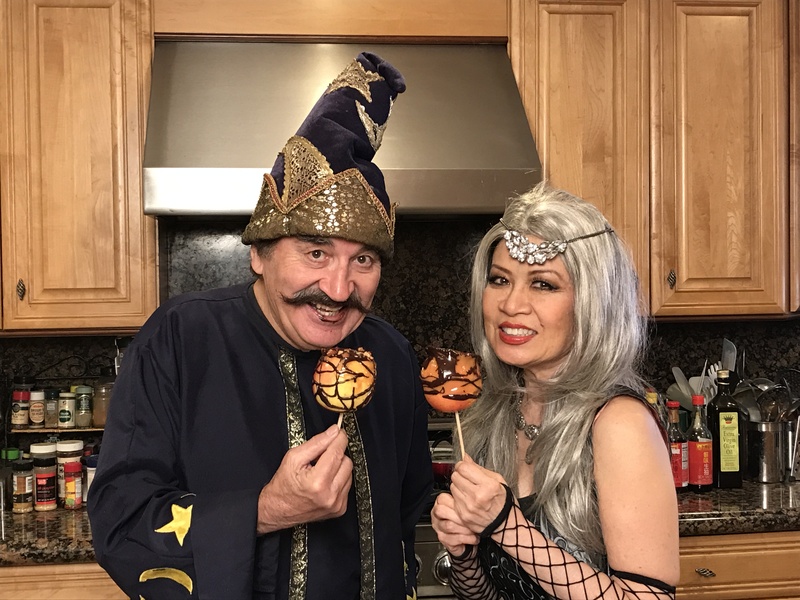 She sent her halloween video to renowned, multi award-winning filmmaker and frequent collaborator Gregory Hatanaka for a laugh and he encouraged her to create the show for Amazon. Joycelyne had just shot her role in Gregory's film, "Samurai Cop 2: Deadly Vengeance" and they both are slated to work on more films together. "I'm delighted to be a part of Joycelyne's wonderful and fun filled show which promises to have an exciting first season with her and her celebrity guests," said Gregory. Joycelyne's love affair with food began as she watched her father prepare dishes in the family restaurant named after her mother. "An aspiring actress, my mother was encouraged as my dad vowed to put her name in lights. He named the place Mabel's Cafe," said Joycelyne. She grew up on all American cuisine and could order anything to eat which fueled her appetite for adventurous eating. Her dream was to become Betty Crocker. She majored in Home Economics at UCSB. With a stage mom in the background, she had already started a career as a child star and left Santa Barbara to transfer to UCLA to continue acting on the side. As fate would have it, there was no Home Ec major offered at UCLA. Fortunately all her credits transferred handily to the Theatre Arts department so she majored in Theatre with an English minor. She studied journalism and was able to combine her talents as she secured a contract with Simon and Schuster to write a chapter in their book, "Where the Fun is, USA". This enabled her to critique restaurants and fun venues for college students. Food and fashion was her passion so she studied stage costuming and fashion design and was chosen for the college board of Mademoiselle magazine. She wrote for the Daily Bruin and did a special assignment on marijuana on campus for TRUE magazine. Coming from a traditional Asian family, she was encouraged to secure a teaching credential from other relatives who did not feel acting was a trustworthy profession. She secured a masters degree in urban education at Pepperdine University. Her first assignment was in Watts as a preschool teacher in the head start program. This required her to prepare food for 15 children with a budget of $.25 per child. This was to form the nucleus of her cooking show! She created a cookbook with multicultural recipes from parents at the school. She also studied nutritional science and was very much into good tasting and healthy food on an extremely limited budget. As a voice over artist, she secured a job doing recorded restaurant recommendations and soon was asked to write copy due to her food addiction. It was evident she had eaten at most of the places! She also voiced a documentary called "Amazing Foods from A to Z". A year ago Joycelyne auditioned for Wolfgang Puck's new Novo pro oven. She had already written her cookbook. She was given a deluxe brand-new oven to try! They wanted a tour of her kitchen, so she recorded it on her iPhone and posted it on YouTube. Next they asked for her to cook something in the the oven. She also recorded that and posted it. Soon she was getting requests and even food preparation questions on her Facebook messenger! Joycelyne simultaneously was doing pinup modeling with Kim Marra, a photographer who she met having done makeup on Ice T's wife Coco. He saw her videos and wanted to film more! She thought it would be fun to include her friend Bill Perron who she has done magic and burlesque with. Together they do comedy and magic and have a ton of costumes. Bill has guested on the pilot episode and a couple of others. So far award-winning actress and blogger Vida Ghaffari (The Mindy Project, Jimmy Kimmel Live, So Very Vida) ​​also guested on the show and there will be more star studded guests in the future. "I really enjoyed guesting on Joycelyne's show. She is a true chef and I can barely fry an egg, so it was a real learning experience for me. She really knows how to make cooking fun, easy and inexpensive. 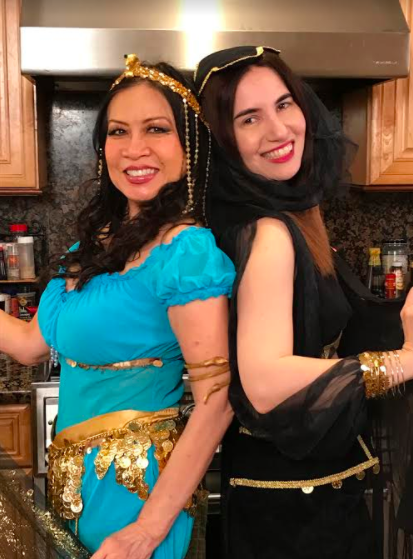 Additionally, Joycelyne requested that I wear a belly dancer costume to add to theme of the show. I haven't shown my belly in years as I like to eat and it shows, but was willing to make the sacrifice for her and her show!" said Vida. Her show combines food, fun, education, and entertainment all in one! It is not scripted because Joycelyne likes to keep it real and that's what the audience relates to. Her cookbook shows how to live on $25 a week per person. It's also entitled Cooking In with Joycelyne, named after her show.